With its roots in the agricultural community of Westmoreland County, Scottdale Builders has expanded over the years to handle a wide range of projects and construction methods. We provide construction expertise in many different types of projects, offer flexibility in working in a variety of ways with Owners and are established as a local presence and work force. We are not tied to one type of construction. We can work with you to determine the best construction method to meet your needs. 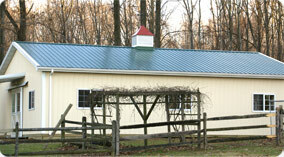 Any of these buildings can be treated with metal siding/roofing, shingle roofing, split-faced block or brick facades. *Post-frame buildings are sometimes referred to as “pole barns” but this type of construction is used for more than simple agricultural buildings. It can refer to any building using post and beam construction and can be used for many types of commercial buildings. We are owner-operated – we have pride in our projects and our strong relationships with customers. You are working directly with the Owners. We live and work in the southwestern Pennsylvania region. Our work is primarily in Westmoreland and surrounding counties including Fayette, Indiana, Washington, Somerset and Allegheny. We are here to support our customers’ on-going needs. We stand behind our work and have a strong local reputation. We have many local references and buildings for you to visit.